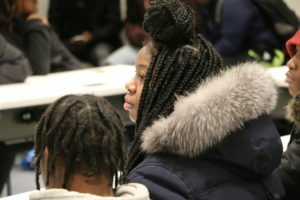 This winter, 10th graders at Kurt Hahn, one of our schools in Brooklyn, have been participating in a Learning Expedition about genocide, and have been exploring the roots of the term itself, as well as investigating the origins and aftermath of modern genocides. As the Learning Expedition continued, the students started to question what their roles as the next generation of world leaders and decision-makers will be. How should they learn from the genocides of the past? And how can they prevent them in the future? 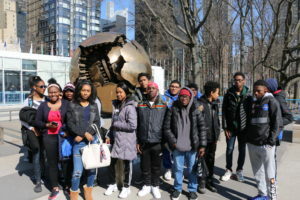 To explore those questions, the students visited the United Nations Office on Genocide Prevention and the Responsibility to Protect, which focuses on preventing genocide, war crimes, ethnic cleansing, and crimes against humanity across the globe. 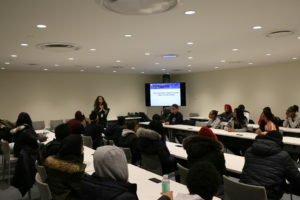 While at the UN, students participated in a Q & A with Claudia Diaz, one of the Office’s analysts. One student asked a simple question at the beginning of the visit, “how many genocides have there been?” Ms. Diaz’ answer: “Officially, three.” They are the Rwandan, Bosnian, and Cambodian genocides, but to the students’ shock, don’t include the Holocaust, or the genocides in Darfur, nor the current atrocities against the Rohingya people. Students were surprised by this: surely these other mass murders should count? As Ms. Diaz explained, the members of the UN must come to a consensus about which events qualify as genocides; and consensus can be extremely difficult to reach, especially at the UN. The students were deflated by this news. “Genocide separates people around the world. And instead of working together, we’re fighting against each other.” Another student added, “[deciding what does and doesn’t qualify] forces us to choose sides,” at a time when we should be banding together to fight these atroci ties. Students also learned about the economics of genocide, as well as the economics of preventing it. “Money!” shouted one student, when asked to name one concern all nations have in common. Indeed, recovering from genocide is unfathomably expensive, and as crass as it may have seemed to students, the Office uses economic evidence to encourage prevention. So what now? What do the students think they can do to help prevent genocide? Many of the students agreed that conflict management and community building are central to genocide prevention. At school, they see the power of community building and learn tools for ending conflict before it starts in Crew, our unique advisory model. Crew fosters relationship-building skills, teaches students about conflict resolution, and encourages empathy for each other, no matter a person’s gender, race, or religion. In crew, “nobody is separated,” said one student. “We should teach it to other schools!” added another. Huge thanks to Claudia Diaz of the UN’s Office on Genocide Prevention and the Responsibility to Protect for hosting our students.